These delicious seafood skewers are great on the BBQ or chargrilled in the kitchen - whatever the weather! Preheat the oven to 160°C / 140°C fan / gas mark 3. If using wooden skewers, soak them in cold water whilst preparing everything else. Prepare your seafood and place onto a plate, then squeeze over lemon and drizzle with oil. Season with a little salt and pepper. Cover and put in the fridge. Assemble your seafood onto the skewers. TIP: Fold the salmon and prawns to puncture twice with the skewer. This should make them more secure. Once you have assembled your skewers, place them onto a hot griddle pan. They should take about 5-7 minutes to cook, you will soon start to see the seafood to change colour. 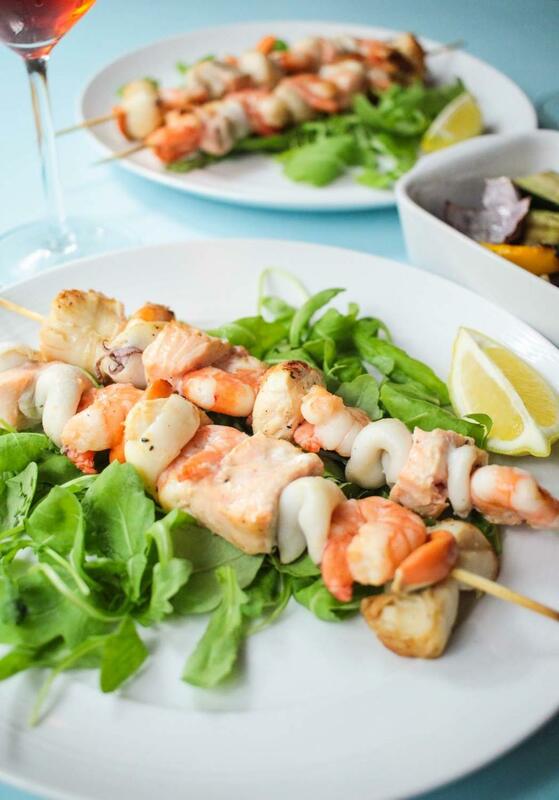 When your seafood skewers are cooked place them onto a bed of rocket and serve with the chargrilled vegetables. Enjoy with an Italian spritz.